It seems as if time is one of the most scarce resources we have in life and work. I see leaders running from one meeting to the next never really processing and reflecting what they just learned or created in the previous meeting. You see physicians working 8+ hours in their practice each day, and in the evening they spend another 2+ hours on charting. They feel trapped in the world where they never catch up. Nobody has time for anything these days. Everyone is in a rush; everyone is busy. And it feels like time is running away. But it only feels this way if we are less conscious and feel trapped in the wheel of busyness, reaction, and victimhood. Because in the end, anything can be taken away from us, except time. Time is all we have. Nobody can take it away without our permission. The problem is we give it away to people, circumstances, workplaces, that don’t satisfy us or don’t move us forward. I speak with countless leaders wasting precious time in unproductive meetings; time that they never get back. But rather than stand up and engage others to make these meetings more meaningful, they accept it silently or complain openly to people who have no influence. Of course, when we give away time to things that don’t bring pleasure or feel unproductive, it feels even more that we just don’t have enough time. So when you don’t have enough time or time is running away too quickly, remember the affirmation above and notice what new insights open up for you. I also just read a nice reminder that Cheryl Richardson shared in her newsletter. She learned from Deepak Chopra twenty years ago: Stretch time. For example, you are supposed to lead a meeting in 30 minutes. The document that is supposed to be discussed in the meeting isn’t finished yet. Your assistant is still working on finalizing numbers, and once she is done with that, she still needs to print it out. Time seems not on your side, and your imagination of how this meeting could bomb raises your blood pressure. What can you do to let go of the stress and deflect your mind? Which could include sitting in a chair at your office, closing your eyes, taking a few deep breaths, letting your stressful thoughts settle and pass, allowing your body to relax and your mind to calm down. Image the time slowing down and trust that the meeting will turn out to your greatest good. You don’t know yet how and you don’t need to figure it out. When the mind is calm, the right idea will come at the right time. Try it out and share your experiences below. I know it is not always easy to put trust out but what else there is to do? And remember, you have more than enough time. 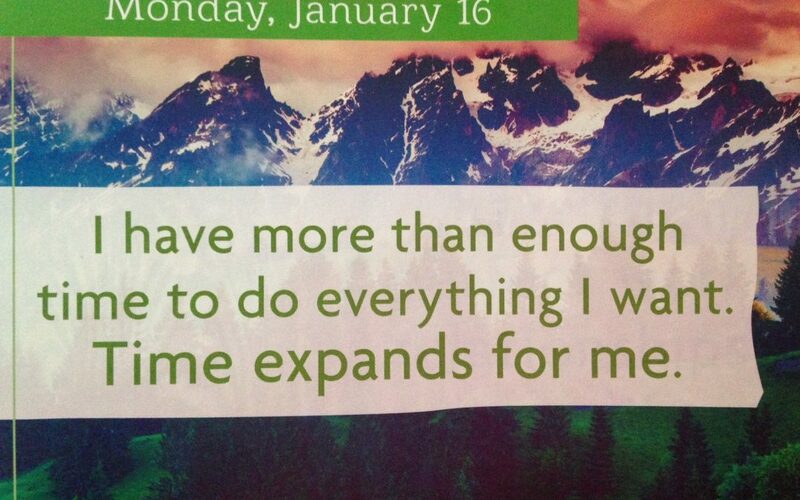 It expands for you.